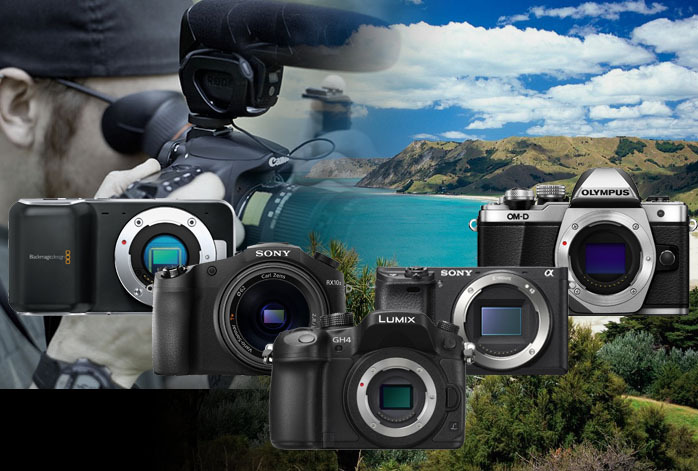 In the last recent years, mirrorless cameras have become increasingly popular on the market. They are used a lot for various purposes, including video recording. A lot of people have even shifted their preference from DSLR cameras to mirrorless cameras for this specific task, as they tend to be more compact, more portable, quieter, more reliable under low-light conditions, and relatively more affordable. Now, either you are an amateur or professional video maker running on a tight budget, choosing the right mirrorless camera for video recording can be quite tricky and difficult, especially with the number of choices available on the market and the newly developed 4K video quality. – Video quality. Having the 4K resolution is great, but resolution is not everything. The video should have decent frame rate, color depth and accuracy, dynamic range, and exposure as well. – Sensor. The sensor resolution and size are crucial factors that affect the image quality. The higher the sensor resolution, the sharper and more detailed the images can be. The larger the sensor size, the better the color depth and dynamic range. – Other features. Wireless connectivity is especially cool and handy. Having a weather-sealed body is a big advantage – some people may even consider this as a must. A lot of pro filmmakers and music video producers have jumped ship from DSLRs to Panasonic LUMIX GH4. Featuring a 16.05MP Digital Live MOS sensor with a 4-CPU Venus Engine image processor, Panasonic LUMIX GH4 boasts superb image quality! It is quite versatile, as it is able to record high-quality videos in both UHD 4K (3840 x 2160) at 30p/24p and DCI 4K (4096 x 2160) at 24p. Thanks to the very powerful system, it has not only very high number of pixels and pixel density, but also ultimately true colors, excellent dynamic range, and accurate exposure. Panasonic LUMIX GH4 is one particular mirrorless camera that is high-performing and well-made. The AF system is also fast and smart, certainly reliable for both stills and videos. Well, keep in mind that it uses a Micro Four Thirds (MFT) sensor, so the crop factor is quite square-like. You will need to use a very wide angle lens if you want to capture cinematic landscape images. But this shouldn’t be an issue because it is compatible with various lenses. Being able to swap lenses according to the situation at hand means that you can be more creative than ever. If you are a filmmaker or serious hobbyist, Panasonic LUMIX GH4 is definitely a great choice for a limited budget. Check the best price for Panasonic LUMIX GH4 here! For the creative minds, especially you who like slow-motion videos, you can take Sony DSC-RX10M II as far as your creativity goes. This is one of the best mirrorless cameras for video recording that you can get from the market. Using the world’s first 20.2MP 1-inch Exmor RS stacked back-illuminated CMOS, Sony DSC-RX10M II is able to provide high-resolution 4K movie recording with direct pixel readout and no pixel binning, as well as an ultra-wide frame rate range, up to 960 fps for slow-motion movie! Well, in 4K, the max frame rate is ‘only’ 248 fps. Still impressive. In addition, the AF system is also very fast, able to reach speeds as fast as 0.09 seconds, with smooth, highly precise focus driving. Its image quality is certainly superior, with excellent colors, details, and especially sharpness, thanks to the built-in image stabilization system. It also offers a great range, 24-200mm super zoom with constant f/2.8 aperture. It is weather-sealed against moisture and dust, and comes with built-in WiFi and NFC. Check the best price for Sony DSC-RX10M II here! Perhaps a little bit budget-friendlier than Sony DSC-RX10M II, Sony Alpha a6300 is an excellent alternative if you want to shoot professional cinematic videos. It is armed with a 24.2MP APS-C sensor, allowing for a landscape crop factor, with an accelerated pixel readout. Sony Alpha a6300 boasts for having the world’s fastest AF system, which can be as fast as 0.05 seconds, very reliable for both stills and videos. Well, it does not reach extreme frame rates like Sony DSC-RX10M II, but the internal UHD 4Kp30 and FHD 1080p120 should be sufficient for most professional works. It also has a weather-sealed magnesium alloy body, WiFi, and NFC. Check the best price for Sony Alpha a6300 here! Blackmagic is one particular company that has produced several mirrorless camera models that are specially designed for video recording. Their cameras don’t take stills (though you can actually capture stills from the recorded video, something like taking screenshots). Blackmagic Pocket Cinema Camera is one that holds excellent value for the money. Available at a relatively affordable price, it can generate superb Full HD 1080p videos. Well, it doesn’t support 4K, but this is not a deal-breaker, considering that we are still living in the era of Full HD content. The sharp details, solid colors, and wide dynamic range are its greatest strengths. It can easily rival the output quality of many more expensive models. It is compatible with various Micro Four Thirds (MFT) format lenses. Two nifty features are the ability to zoom in to 1:1 and the support of open file formats for ultimate compatibility across platforms. Unfortunately, it lacks WiFi. Check the best price for Blackmagic Pocket Cinema Camera here! Again, Olympus OM-D E-M10 Mark II has managed to get into the list of best cameras. Its affordable and budget-friendly price makes it a huge value for the money. Like Blackmagic Pocket Cinema Camera, Olympus OM-D E-M10 Mark II also records videos in Full HD 1080p, with 60fps maximum frame rate. However, the image quality is quite surprising. It has punchy colors, accurate exposure, and very minimum noise. Furthermore, the five-axis image stabilization system is very powerful and reliable for erasing blurs and vibrations, even from the shakiest hands. It is also a fast camera, and it has interestingly very quiet controls. Take a look: Fujifilm X-T10 vs Olympus OM-D E-M10 Mark II. Check the best price for Olympus OM-D E-M10 Mark II here! In general, they all are able to deliver excellent video quality. However, they may excel on different purposes and under different conditions. Which is the mirrorless camera that seems to be the most attractive?